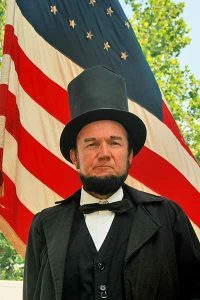 The Delaware County Historical Society is pleased to present a Civil War era discussion with a key historical figure – President Abe Lincoln (Reenactor John Cooper). John Cooper, as Abe Lincoln, will reminisce about the Civil War, politics, and life during the 1800s. You are encouraged to bring questions to ask of Abe. Please limit your questions to the Civil War, politics, and life during the 1800s. Tickets are not required for this program; it is free and open to the community. There will be a Donation Break during the program. John Cooper has been portraying President Abraham Lincoln for more than 25 years. A co-worker regularly commented that he reminded her of Abe Lincoln due to his tall stature and Lincoln-styled beard. After discovering a Lincoln-style coat in his mother’s attic, he acquired a stovepipe hat, and made presentations in celebration of President’s Day at the Pickerington elementary schools. Mr. Cooper is a self-avowed history nut; considers Lincoln as his favorite President and our greatest President (even above George Washington). He has an extensive personal history library that includes over 100 books about Lincoln and his colleagues. Mr. Cooper has graced Delaware with his talent on numerous occasions, most recently; the Delaware County Fair and the Historical Society’s “150th Commemoration of Delaware County in the Civil War”. The Delaware County Historical Society is a non-profit organization funded by donations and fueled by a marvelous corps of dedicated volunteers. We collect, conserve, research, and catalogue artifacts of historical import. We obtain, maintain, and make available to the community historic places including The Barn at Stratford. We support county school history teachers and students. We prepare and present programs (like this one) and exhibits year-round to educate and promote Delaware County History.